Marquez, DF & CD Villagonzalo. Magnetic orbit to orbit interaction in a two-dimensional electron gas, ASTHRDP Graduate Scholars' Conference, P130 (PICC, Pasay City, 2018). Sombillo, N, R Banzon & C Villagonzalo. Effect of error tolerance probability to the fidelity of a 4-qubit quantum search simulation, 2018 ICTP Asian Network School and Workshop on Complex Condensed Matter Systems, P.16 (Suranaree University of Technology, Thailand, 2018). Ferrer, NJB & C Villagonzalo. Effect of varying the atomic bond stiffness in the heat baths to the thermal conductance of a graphene junction, in Proceedings of the 36th Samahang Pisika ng Pilipinas Physics Conference, SPP-2018-3B-04 (Puerto Princesa City, Philippines, 2018). Mactal, GAL & C Villagonzalo. Investigating the diffusion of an atom on the graphene lattice, in Proceedings of the 36th Samahang Pisika ng Pilipinas Physics Conference, SPP-2018-PB-04 (Puerto Princesa City, Philippines, 2018). Marquez, DF & C Villagonzalo. An effective field analysis of magnetic orbit-to-orbit interactions in a two-dimensional electron gas, in Proceedings of the 36th Samahang Pisika ng Pilipinas Physics Conference, SPP-2018-PB-14 (Puerto Princesa City, Philippines, 2018). Narag, DVJC & C Villagonzalo. Harmonic disturbance on the topological phases of a Chern insulator, in Proceedings of the 36th Samahang Pisika ng Pilipinas Physics Conference, SPP-2018-PB-24 (Puerto Princesa City, Philippines, 2018). Ottong, ZJ & C Villagonzalo. Impact of the absorption and reflection of signals on the radiation-induced bystander effect, in Proceedings of the 36th Samahang Pisika ng Pilipinas Physics Conference, SPP-2018-PC-22 (Puerto Princesa City, Philippines, 2018). Baldo, III, CF & C Villagonzalo. Spin inverter and polarizer curved nanowire driven by Rashba and Dresselhaus spin-orbit interactions, Physica E 83, 498-504 (2016). Baldo, III, C & C Villagonzalo. A Multi-functional Spintronic Device Driven by Spin-orbit Interactions, Annual Meeting of the Physical Society of the Republic of China, O3-NP1 01 (National Sun Yat-sen University, Kaohsiung, 2016). Cortez, A & C Villagonzalo. k·p Perturbation Model of the Three-terminal Ferromagnet-Insulator-Semiconductor Device with Spin-Orbit Interaction, in Proceedings of the 34th Samahang Pisika ng Pilipinas Physics Congress, SPP-2016-PA-17 (University of the Philippines Visayas, Iloilo City, 2016). Ilano, ND, R Banzon & C Villagonzalo. Near-resonant approximation in quantum search simulation, in Proceedings of the 34th Samahang Pisika ng Pilipinas Physics Congress, SPP-2016-2C-01 (University of the Philippines Visayas, Iloilo City, 2016). Baldo, III, CF & C Villagonzalo. Optimal curvilinear transport of a spin-polarized electron with Rashba and Dresselhaus spin-orbit coupling in a uniform magnetic field, 9th International Conference on Computational Physics, C3-13 (National University of Singapore, 2015). Ilano, ND, C Villagonzalo & R Banzon. 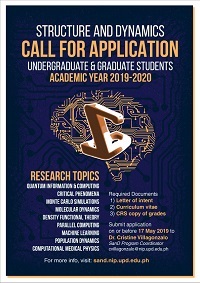 Effect of varying the position of the ancilla qubit and the coupling constants in the simulation of Grover's quantum search algorithm, 9th International Conference on Computational Physics, P-62 (National University of Singapore, 2015). Villagonzalo, C. Spectral and thermodynamic properties of two-dimensional electron systems in the quantum Hall regime, Workshop on Theories in Quantum Phenomena and Condensed Matter Physics (University of the Philippines Los Baños, Laguna, 2015). Baldo, III, CF & C Villagonzalo. Electron spin polarization along a one-dimensional wire with periodic Rashba and uniform Dresselhaus spin-orbit couplings, in Proceedings of the 33rd Samahang Pisika ng Pilipinas Physics Congress, SPP-2015-3B-05 (University of Northern Philippines, Vigan City, 2015). Cortez, A & C Villagonzalo. Electric field and spin precession effects on spin injection to semiconductors in three-terminal ferromagnet-insulator-nonmagnetic junctions, in Proceedings of the 33rd Samahang Pisika ng Pilipinas Physics Congress, SPP-2015-PA-44 (University of Northern Philippines, Vigan City, 2015). Ilano, ND, R Banzon & C Villagonzalo. A critically damped quantum search may not necessarily be optimal, in Proceedings of the AQIS Conference 2015, 147-148 (Korea Institute for Advanced Study, Seoul, 2015). Ilano, ND, RS Banzon & C Villagonzalo. Simulation of Grover's algorithm with position-variation of the ancilla qubit, in Proceedings of the 33rd Samahang Pisika ng Pilipinas Physics Congress, SPP-2015-2B-06 (University of Northern Philippines, Vigan City, 2015). Itable, GMM & C Villagonzalo. Non-equilibrium collective transport in an Ising chain with Kawasaki dynamics, in Proceedings of the 33rd Samahang Pisika ng Pilipinas Physics Congress, SPP-2015-5C-03 (University of Northern Philippines, Vigan City, 2015). Baldo, III, CF & C Villagonzalo. Spin-orbit coupled transport in a curved quantum wire, Physica E 63, 93-98 (2014). Ilano, ND, C Villagonzalo & R Banzon. Simulation of Grover's algorithm with spatially-dependent coupling constant, Okinawa School in Physics: Coherent Quantum Dynamics, 19 (Okinawa Institute of Science and Technology, Japan, 2014). Villagonzalo, C. Fundamental studies and simulation of nanostructured materials, 6th Asian Computational Materials Design Workshop (De La Salle University, Manila, 2014). Baldo, III, CF & C Villagonzalo. Magnetoconductance of a spin polarized electron along a curved one-dimensional wire, in Proceedings of the 32nd Samahang Pisika ng Pilipinas Physics Congress, SPP2014-1A-6 (University of the Philippines Diliman, Quezon City, 2014). Ilano, ND, C Villagonzalo & RS Banzon. Working precision in a simulation of Grover's algorithm in an Ising spin system, in Proceedings of the 32nd Samahang Pisika ng Pilipinas Physics Congress, SPP2014-5A-2 (University of the Philippines Diliman, Quezon City, 2014). Gammag, R & C Villagonzalo. Two-dimensional electron gas tilt-induced Landau level crossings, Solid State Commun. 156, 16-20 (2013). Gammag, R & C Villagonzalo. Signatures of Landau level crossings in a two-dimensional electron gas, 20th International Conference on Electronic Properties of Two-Dimensional Systems, MoP110 (Wrocław University of Technology, Poland, 2013). Baldo, III, CF & C Villagonzalo. Spin switching on a quantum wire with spin orbit coupling in a uniform magnetic field, in Proceedings of the 31st Samahang Pisika ng Pilipinas Physics Congress, SPP2013-5B-4 (University of San Carlos, Cebu City, 2013). Capili, MN, RS Banzon & C Villagonzalo. Determination of the percolation critical exponent as measure of dimension, in Proceedings of the 31st Samahang Pisika ng Pilipinas Physics Congress, SPP2013-4C-6 (University of San Carlos, Cebu City, 2013). Ilano, ND, C Villagonzalo & RS Banzon. The effect of the Hadamard gate decomposition in the simulation of Grover's algorithm, in Proceedings of the 31st Samahang Pisika ng Pilipinas Physics Congress, SPP2013-5B-2 (University of San Carlos, Cebu City, 2013). Suico, J, RS Banzon & C Villagonzalo. Characteristics of non-spanning clusters in a percolating two-dimensional square lattice, in Proceedings of the 31st Samahang Pisika ng Pilipinas Physics Congress, SPP2013-PB-10 (University of San Carlos, Cebu City, 2013). Baldo, III, CF & C Villagonzalo. Low-lying spin excitations due to next-nearest neighbour interactions in a ferromagnetic lattice with a body-centred cubic (bcc) crystal structure, J. Phys. Conf. Ser. 400, 032007 (2012). Gammag, R & C Villagonzalo. The interplay of Rashba spin-orbit interaction and Landau level broadening on a two-dimensional electron gas under a tilted magnetic field, J. Phys. Conf. Ser. 400, 042009 (2012). Gammag, R & C Villagonzalo. Persistent spin splitting of a two-dimensional electron gas in tilted magnetic fields, Eur. Phys. J. B 85, 22 (2012). Gammag, R & C Villagonzalo. Quenching of the DOS beats in a two-dimensional electron gas in tilted magnetic fields, Solid State Commun. 152, 757-761 (2012). Baldo, III, CF & C Villagonzalo. Rashba and Dresselhaus spin-orbit interactions in a curvilinear motion of a spin-polarized electron, in Proceedings of the 30th Samahang Pisika ng Pilipinas Physics Congress, SPP-2012-054 (De La Salle Health Sciences Institute, Dasmariñas, Cavite, 2012). Capili, MN, C Villagonzalo & RS Banzon. Percolation critical exponent of a constrained lattice, in Proceedings of the 30th Samahang Pisika ng Pilipinas Physics Congress, SPP-2012-004 (De La Salle Health Sciences Institute, Dasmariñas, Cavite, 2012). Ilano, ND, C Villagonzalo & RS Banzon. The effect of RF distribution on the implementation of quantum CN gate in an Ising spin chain, in Proceedings of the 30th Samahang Pisika ng Pilipinas Physics Congress, SPP-2012-056 (De La Salle Health Sciences Institute, Dasmariñas, Cavite, 2012). Villagonzalo, C & R Gammag. The intrinsic features of the specific heat at half-filled Landau levels of two-dimensional electron systems, J. Low Temp. Phys. 163, 43-52 (2011). Capili, MN, C Villagonzalo & RS Banzon. Determination of the critical exponent β in site percolation using average occupation probability on a square lattice, in Proceedings of the 29th Samahang Pisika ng Pilipinas National Physics Congress, SPP2011-5A-3 (University of the Philippines Diliman, Quezon City, 2011). Ilano, ND, RS Banzon & C Villagonzalo. Optimizing the damped quantum search algorithm, in Proceedings of the 29th Samahang Pisika ng Pilipinas National Physics Congress, SPP2011-4A-4 (University of the Philippines Diliman, Quezon City, 2011). Lazo, H, R Banzon & C Villagonzalo. Persistence in the zero temperature dynamics of the 1D Ising model with long range interactions, in Proceedings of the 29th Samahang Pisika ng Pilipinas National Physics Congress, SPP2011-PB-33 (University of the Philippines Diliman, Quezon City, 2011). Villagonzalo, C & RP Gammag. Long range disorder effects on the heat capacity of two-dimensional electron systems, 9th Asia-Pacific Workshop on Materials Physics, 66-67 (Hanoi University of Science, Vietnam, 2010). Baldo, III, CF & C Villagonzalo. Spin waves in a simple ferromagnetic cubic lattice using the Heisenberg model with nearest and next-nearest neighbor interactions, in Proceedings of the 28th Samahang Pisika ng Pilipinas Physics Congress, SPP-2010-006 (Meralco Management and Leadership Development Center, Antipolo City, 2010). Gammag, RP & C Villagonzalo. Uncertainty relation of the momentum components of a two-dimensional electron system under a tilted magnetic field, in Proceedings of the 28th Samahang Pisika ng Pilipinas Physics Congress, SPP-2010-005 (Meralco Management and Leadership Development Center, Antipolo City, 2010). Gammag, R & C Villagonzalo. Crossover of the specific heat from the quantum Hall to the classical regime, AIP Conf. Proc. 1119, 213 (2009). Jacosalem, NJ & C Villagonzalo. Numerical investigations of symmetric embedded quantum well systems using the shooting method and transfer matrix technique, AIP Conf. Proc. 1119, 219 (2009). Villagonzalo, C, J Bornales & JG Betoya‐Nonesa. Women in physics in the Philippines: Quantized yet taking steps toward a mature science culture, AIP Conf. Proc. 1119, 155-156 (2009). Gammag, RP & C Villagonzalo. Sensitivity of the specific heat to the electronic density of states, in Proceedings of the 27th Samahang Pisika ng Pilipinas Physics Congress, SPP-2009-062 (Development Academy of the Philippines Convention Center, Tagaytay City, 2009). Ilano, ND, RS Banzon & C Villagonzalo. Damped quantum search in an Ising spin system, in Proceedings of the 27th Samahang Pisika ng Pilipinas Physics Congress, SPP-2009-006 (Development Academy of the Philippines Convention Center, Tagaytay City, 2009). Johnson, S & C Villagonzalo. One dimensional migration of DNA in the presence of point particle traps, in Proceedings of the 27th Samahang Pisika ng Pilipinas Physics Congress, SPP-2009-071 (Development Academy of the Philippines Convention Center, Tagaytay City, 2009). Lazo, H, C Villagonzalo & RS Banzon. Site percolation of a fixed lattice size with growing regions of disallowed occupancy, in Proceedings of the 27th Samahang Pisika ng Pilipinas Physics Congress, SPP-2009-036 (Development Academy of the Philippines Convention Center, Tagaytay City, 2009). Panganiban, EA, C Villagonzalo & RS Banzon. Thresholds of percolating systems with two symmetric forbidden zones having a constant separation, in Proceedings of the 27th Samahang Pisika ng Pilipinas Physics Congress, SPP-2009-034 (Development Academy of the Philippines Convention Center, Tagaytay City, 2009). Gammag, RP & C Villagonzalo. The interplay of Landau level broadening and temperature on two-dimensional electron systems, Solid State Commun. 146, 487-490 (2008). Amarra, A, C Villagonzalo & RS Banzon. Simulation of Grover's algorithm on a one-dimensional two-level Ising spin system, in Proceedings of the 26th Samahang Pisika ng Pilipinas Physics Congress, SPP-2008-004 (University of the Phlippines Baguio, Baguio City, 2008). Gammag, RP & C Villagonzalo. The 2DES chemical potential: Revealing the link from the classical to the quantum Hall regime, in Proceedings of the 26th Samahang Pisika ng Pilipinas Physics Congress, SPP-2008-026 (University of the Phlippines Baguio, Baguio City, 2008). Hernal, MJ, C Villagonzalo & RS Banzon. Spanning a space in a quasi-one dimensional lattice vs. two-dimensional lattice with square banned sites, in Proceedings of the 26th Samahang Pisika ng Pilipinas Physics Congress, SPP-2008-163 (University of the Phlippines Baguio, Baguio City, 2008). Jacosalem, NJ & C Villagonzalo. Realignment of energy spectra of modified Pöschl-Teller potentials in a composite quantum well-in-a-well system, in Proceedings of the 26th Samahang Pisika ng Pilipinas Physics Congress, SPP-2008-021 (University of the Phlippines Baguio, Baguio City, 2008). Johnson, S & C Villagonzalo. Simulation of DNA mobility in one-dimension using the bead-spring model, in Proceedings of the 26th Samahang Pisika ng Pilipinas Physics Congress, SPP-2008-138 (University of the Phlippines Baguio, Baguio City, 2008). Capili, MN, C Villagonzalo & RS Banzon. Calculation of the average occupation probability for spanning cluster formation in site percolation, in Proceedings of the 25th Samahang Pisika ng Pilipinas Physics Congress, SPP-2007-192 (University of the Phlippines Los Baños, Laguna, 2007). Castro, CD & C Villagonzalo. Analysis of symmetric solutions to the Ginzburg-Landau equations for superconducting films, in Proceedings of the 25th Samahang Pisika ng Pilipinas Physics Congress, SPP-2007-177 (University of the Phlippines Los Baños, Laguna, 2007). Cortez, AD & C Villagonzalo. Analysis of transient heat conduction on aluminum and iron contacts, in Proceedings of the 25th Samahang Pisika ng Pilipinas Physics Congress, SPP-2007-115 (University of the Phlippines Los Baños, Laguna, 2007). Gammag, RP & C Villagonzalo. The influence of the level broadening on the chemical potential and the heat capacity of two-dimensional electron system, in Proceedings of the 25th Samahang Pisika ng Pilipinas Physics Congress, SPP-2007-179 (University of the Phlippines Los Baños, Laguna, 2007). Villagonzalo, C & J Dizon. Reduction of the thermal conductivity in a 1D superlattice, in Proceedings of the 25th Samahang Pisika ng Pilipinas Physics Congress, SPP-2007-022 (University of the Phlippines Los Baños, Laguna, 2007). Gammag, RP & C Villagonzalo. Thermodynamic properties of a two-dimensional electron gas in the fractional quantum Hall regime, in Proceedings of the 24th Samahang Pisika ng Pilipinas Physics Congress, SPP-2006-69 (Ateneo de Davao University, Davao City, 2006). Villagonzalo, C & GR Tongco. A finite temperature magnetic phase transition in a one-dimensional lattice, in Proceedings of the 24th Samahang Pisika ng Pilipinas Physics Congress, SPP-2006-155 (Ateneo de Davao University, Davao City, 2006). Villagonzalo, C & R Flores. Heat capacity of logistic maps with bidirectional coupling, in Proceedings of the 24th Samahang Pisika ng Pilipinas Physics Congress, SPP-2006-22 (Ateneo de Davao University, Davao City, 2006). de la Torre, A & C Villagonzalo. Finite difference scheme for hyperbolic heat conduction with continuous and pulsed heat sources, in Proceedings of the 23rd Samahang Pisika ng Pilipinas Physics Congress, SPP-2005-015 (Central Philippine University, Iloilo City, 2005). Gammag, RP & C Villagonzalo. Magnetic field effects on the chemical potential and specific heat of a 2DEG, in Proceedings of the 23rd Samahang Pisika ng Pilipinas Physics Congress, SPP-2005-040 (Central Philippine University, Iloilo City, 2005). Jaramillo, CO, C Villagonzalo & R Banzon. Constrained percolation in two dimensions, in Proceedings of the 23rd Samahang Pisika ng Pilipinas Physics Congress, SPP-2005-130 (Central Philippine University, Iloilo City, 2005). Vasquez, LJ & C Villagonzalo. Constant perturbation in the tight-binding bands of a single-walled carbon nanotube, in Proceedings of the 23rd Samahang Pisika ng Pilipinas Physics Congress, SPP-2005-019 (Central Philippine University, Iloilo City, 2005). Marco, Jr, R, R Banzon & C Villagonzalo. Hopping in a molecular wire, Science Diliman 16, 10-11 (2004). Morales, MB & C Villagonzalo. Enhancement of Fe magnetic moments in Fe/Co (001) multilayers, Science Diliman 16, 6-7 (2004). Tongco, GR & C Villagonzalo. Dipolar interaction in a one-dimensional Ising ring, Science Diliman 16, 8-9 (2004). Dizon, J & C Villagonzalo. Thermal conductivity in a one-dimensional superlattice, in Proceedings of the 22nd Samahang Pisika ng Pilipinas Physics Congress, 155 (Bohol Tropics Resort, Tagbilaran City, 2004). Gammag, RP & C Villagonzalo. The specific heat of a 2DEG in a magnetic field, in Proceedings of the 22nd Samahang Pisika ng Pilipinas Physics Congress, 154 (Bohol Tropics Resort, Tagbilaran City, 2004). Marco, Jr, R, RS Banzon & C Villagonzalo. Effect of the hopping parameter on the current through a two-atom molecular wire, in Proceedings of the 22nd Samahang Pisika ng Pilipinas Physics Congress, 27 (Bohol Tropics Resort, Tagbilaran City, 2004). Morales, M & C Villagonzalo. Enhancement of Fe magnetic moments in Fe/Co(001) multilayer, in Proceedings of the 22nd Samahang Pisika ng Pilipinas Physics Congress, 72 (Bohol Tropics Resort, Tagbilaran City, 2004). Muldera, J & C Villagonzalo. Thermal efficiency of a quasi-one-dimensional conductor, in Proceedings of the 22nd Samahang Pisika ng Pilipinas Physics Congress, 113 (Bohol Tropics Resort, Tagbilaran City, 2004). Pariñas, R & C Villagonzalo. Pre-collision dynamics of short 1D anharmonic chains, in Proceedings of the 22nd Samahang Pisika ng Pilipinas Physics Congress, 118 (Bohol Tropics Resort, Tagbilaran City, 2004). Sandagon, R, RS Banzon & C Villagonzalo. Variational Monte Carlo of a 2D quantum well system, in Proceedings of the 22nd Samahang Pisika ng Pilipinas Physics Congress, 153 (Bohol Tropics Resort, Tagbilaran City, 2004). Tongco, GR & C Villagonzalo. Dipolar interaction in a 1-D Ising ring, in Proceedings of the 22nd Samahang Pisika ng Pilipinas Physics Congress, 31 (Bohol Tropics Resort, Tagbilaran City, 2004). Vasquez, LJ & C Villagonzalo. Diffusive thermoelectric transport in carbon nanotubes, in Proceedings of the 22nd Samahang Pisika ng Pilipinas Physics Congress, 119 (Bohol Tropics Resort, Tagbilaran City, 2004). Römer, RA, A MacKinnon & C Villagonzalo. Thermoelectric properties of disordered systems, J. Phys. Soc. Jpn. Suppl. A 72, 167-168 (2003). Labora, M & C Villagonzalo. Ab-initio structural investigation of Fe/V (001) multilayers, in Proceedings of the 21st Samahang Pisika ng Pilipinas Physics Congress, 5-8 (University of San Carlos, Cebu City, 2003). Morales, MB & C Villagonzalo. Magnetization and magnetic anisotropy of Fe/Co multilayers: A first-principles calculation, in Proceedings of the 21st Samahang Pisika ng Pilipinas Physics Congress, 446-449 (University of San Carlos, Cebu City, 2003). Villagonzalo, C, AK Setty & BR Cooper. Numerical investigations on the growth textures of Co/Cu multilayers, in Proceedings of the 21st Samahang Pisika ng Pilipinas Physics Congress, 262-265 (University of San Carlos, Cebu City, 2003). Villagonzalo, C, RA Römer, M Schreiber & A MacKinnon. Behavior of the thermopower in amorphous materials at the metal-insulator transition, Phys. Rev. B 62, 16446-16452 (2000). Villagonzalo, C, RA Römer & M Schreiber. Thermoelectric transport properties in disordered systems near the Anderson transition, Eur. Phys. J. B 12, 179-189 (1999). Villagonzalo, C & RA Römer. Low temperature behavior of the thermopower in disordered systems near the Anderson transition, Ann. Phys. (Leipzig) 7, 394-399 (1998).